I’m finally getting back to being able to crochet a little bit after #3 was born. 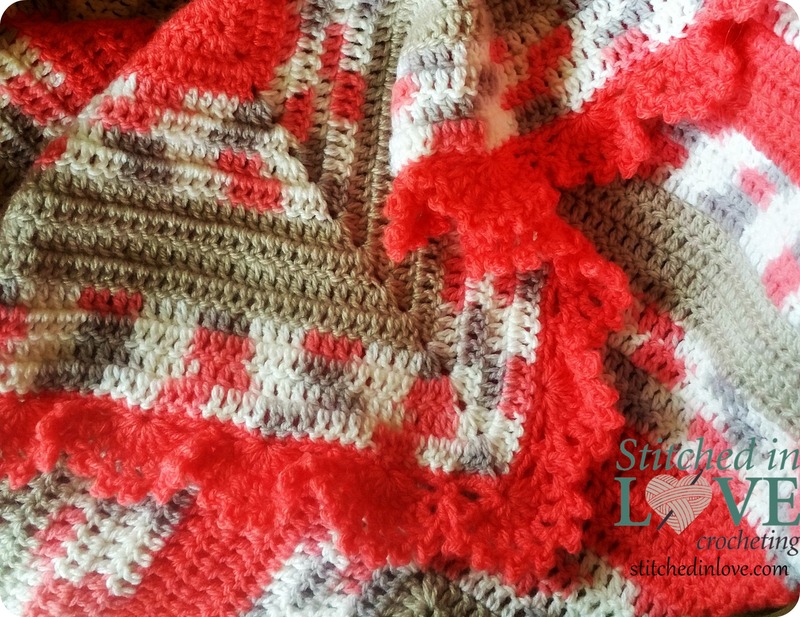 I’ve got several things to post, including the afghan I designed for him. Right now I’m working on some end-of-the-school-year teacher’s gifts for my daughter’s preschool teacher. I had a kit from Annie’s Attic for this felted bag and thought I would use it for one of the gifts. I’ve never done any felting before, aside from making my wool dryer balls. Unfortunately, when I got this felted, I fell in love with it and I don’t think I can give it away. I think I’ll be using it as a bag to carry small crochet projects in. It’s not often that fail in giving away something I have crocheted. My own creativity comes into play with the edging on this piece. I did not write down the pattern for this one, but I will include a very rough account of it below. This is Julie with her afghan after she received it today. Sorry it was late for your birthday! Join all rounds with a sl st in beginning st. Round 1: A round of single crochet. Two sc in each ch 2 at the end of each row and 3 sc in each corner. Round 2: Dc in each sc. 3 dc in each corner. Round 3: Dc, ch 2, sk 2 dc, dc in next dc around. Dc, ch 2, dc in each corner. Round 4: Dc in each dc around, 2 dc in each ch 2 sp. 3 dc in each corner. Round 6: (Dc, ch 2, dc) in each dc, ch 2. (Dc, ch 2, dc) in each corner. Round 7: (Dc, picot, ch 1) 3 times in first ch ch 2 sp, ch 1, dc in next ch 2 sp, ch 1. Around. (Dc, picot, ch 1) 5 times in each corner. Round 8: Dc in ch 1 between first and second picots, ch 5, dc in ch 1 between second and third picots, ch 1, (dc, ch 2, dc in next dc, ch 1. Around. Dc in ch 1 between second and third picots, ch 5, dc in ch 1 between third and fourth picots, ch 1 for each corner. Round 9: Repeat round 7 with 5 (dc, picot, ch 1) in each ch 5 sp. (Dc, picot, ch 1) 7 times for each corner. 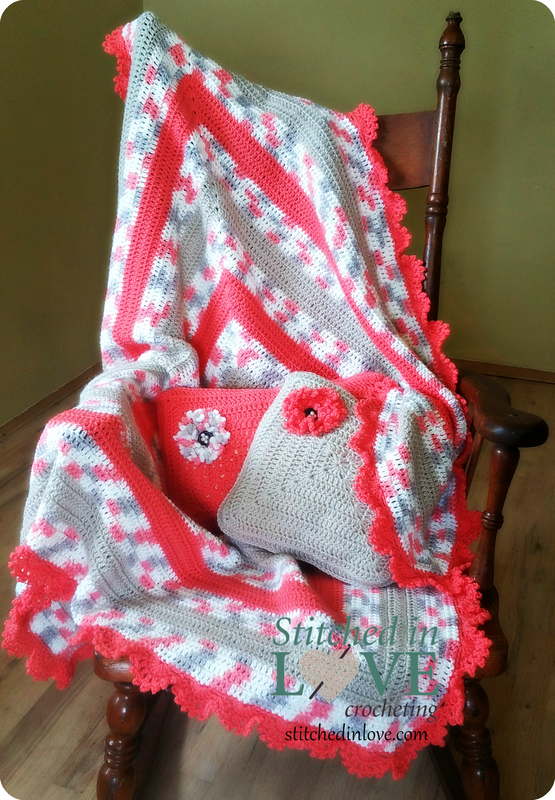 I received a custom order request for this baby afghan from an old friend of mine and I was very honored to be able to accommodate. 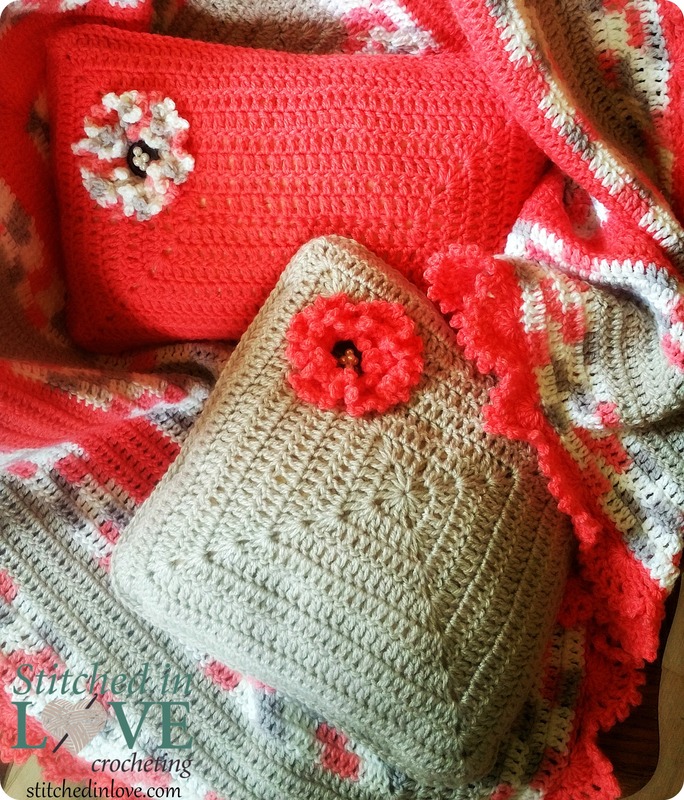 Her Grandfather had crocheted baby afghans for all his great-grandchildren before he passed way. Deanne is now expecting the first great-grandchild since his passing and asked if I could try to reproduce the pattern. Though the result is not exactly the same as his pattern, it is very close and I hope reminds her of him. I think this is probably my favorite request ever. Crocheting an afghan for an order is one thing. But to try to stand-in and create something on behalf of someone who is now gone is very humbling. I was so touched to be asked to make the attempt. Deanne selected three Bernant Baby Sport skeins in a coral, light taupe, and a matching variegated yarn. 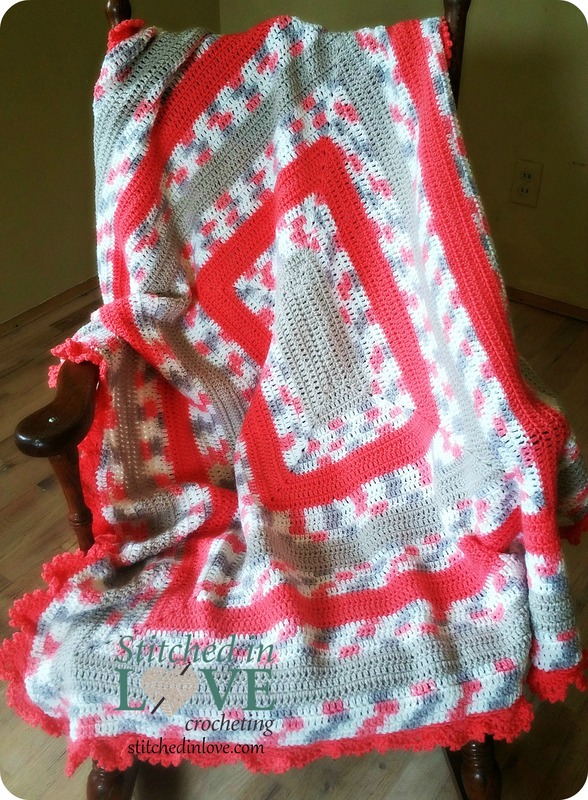 These colors turned out to be just fabulous together and I must say it is one of my favorite afghans I have ever made. When I completed the afghan I still had a lot of yarn left; so I made two solid color pillows to go with it. I made four flowers using the same stitch as the edging on the afghan and sewed them together on each side of the pillows, using a button in the center and adding pearl beads for embellishment. I love how the solid pillows look against the stripes of the afghan. It turned out so pretty that I have listed the set in my Etsy store. I would love to make the set again in some other customized colors. I am also working on writing up the pattern to add to my Ravelry store. 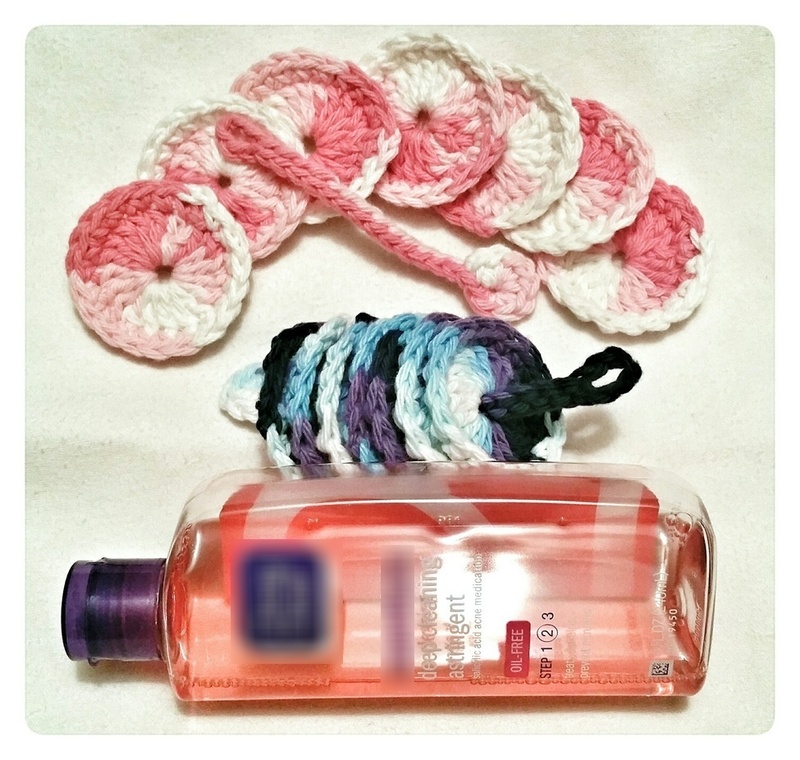 Set of 7, hand crocheted, 100% cotton rounds/makeup removers. Each round is approximately 2″ across. Includes matching cotton hanger to string rounds. Machine wash with your towels and reuse for an eco-friendly and affordable alternative to buying disposable cotton rounds. Available in two colors. More coming soon! I have finally gotten back to the grannies! This cute little square looks like a maze. It can look so different by reversing the order of the colors or by making it in solids. 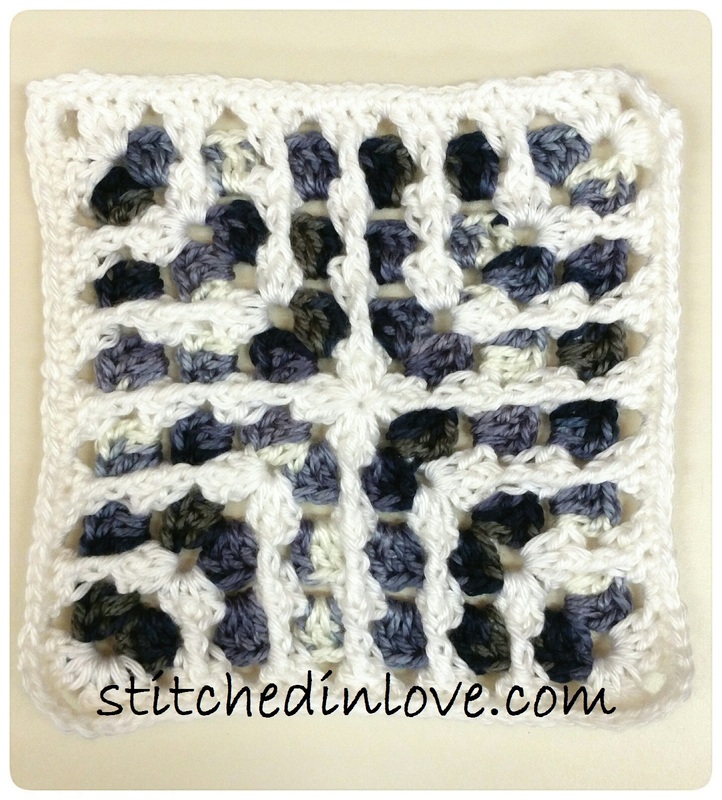 The pattern for this square can be found here and is really very simple if you are comfortable with post stitches! I did modify the pattern for myself just a little bit. It called for treble crochet stitches where it wasn’t really necessary, so I only did trebles on the front post stitches. All other stitches I completed as double crochets. I also joined the corners with a double crochet instead of the chain 3 and slip stitch in the pattern. One thing I would do differently if I did it over would be to only do a chain 2 for the corners instead of a chain 3 to tighten things just a little. So the Granny Square project was supposed to be a 2014 project, but is going to take me well into 2015. There are so many projects that I want to do and just not enough time! The pattern is now available for sale on Ravelry Here! 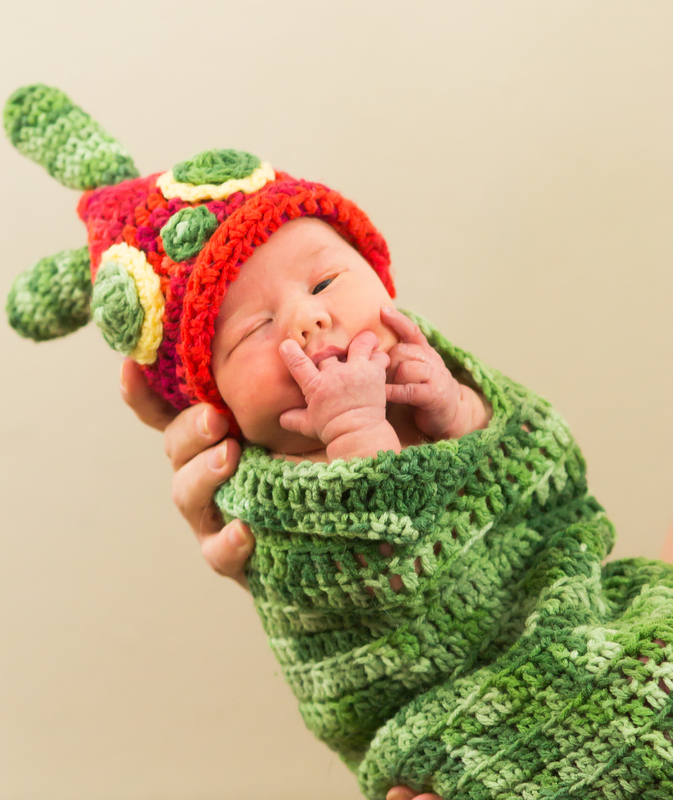 Crochet this adorable cocoon and beanie for your newborn’s photo shoot or Halloween costume! Eric Carle’s Very Hungry Caterpillar is brought to life in this delightful pattern featuring the subtle color variations of the beloved children’s book through the use of variegated yarn. The impression of Caterpillar’s body segments is achieved by alternating rows of both loops and back loop only stitches. Baby can scrunch up inside the cocoon for those adorable newborn pictures. This is only available in newborn size and will fit babies up to 10 lbs. Pattern includes pictures, gauge, crochet and assembly instructions. Enjoy!